Power through your working day with business-grade performance, confident that the thin, light design of the Tecra X40-E is up to the day-to-day pressures of your workload, thanks to extensive testing. From the factory to the office, the Tecra X40-E is secure at every step. Two-factor authentication includes IR-based Windows Hello and a built-in SecurePad with fingerprint reader. And the X40-E includes a slimline security lock slot and magnesium chassis with honeycomb design for physical strength and security. 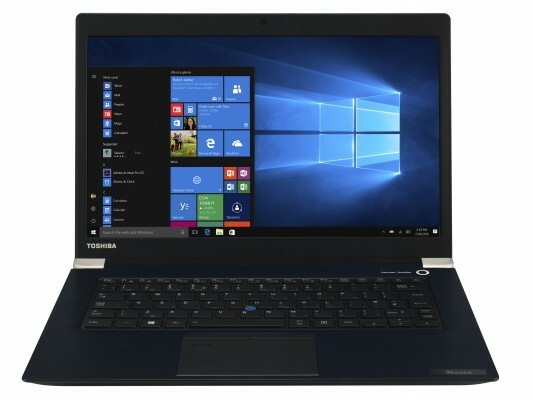 The Tecra X40-E comes with Toshiba's new Hybrid Air Cooling System, which uses two air inlets to maintain an optimum device temperature â€“ without compromising performance. The Tecra X40-E is all you need to keep your productivity up and your laptop's temperature down. The Tecra X40-E is designed to be easy and enjoyable to use. Connect on the go with optional mobile broadband including LTE. In-Cell touch technology lets you work your way â€“ by touch with your fingers and without compromising on the exceptional clarity of the non-glare screen. The Tecra X40-E has been designed to be the compact and mobile powerhouse that ticks every box for business users. Twin Thunderboltâ„¢ 3 ports enable you to work your way â€“ wherever you are. The impeccable operation of your Toshiba product is our highest concern. To get the most out of your IT investment, we offer a wide range of Services that keep your day-to-day business running and perfectly fit your individual needs. Whether you would like to extend your standard warranty, upgrade your support level or manage your assets within one platform â€“ we are the ideal partner at your side!